Ford says it will build only 50 copies of the Mustang Boss 302S, a track-only demon that we've called the greatest track-day Mustang ever. The very first copy off the assembly line met the walls — and hopefully not its end — at the Mid-Ohio track last weekend. UPDATED! 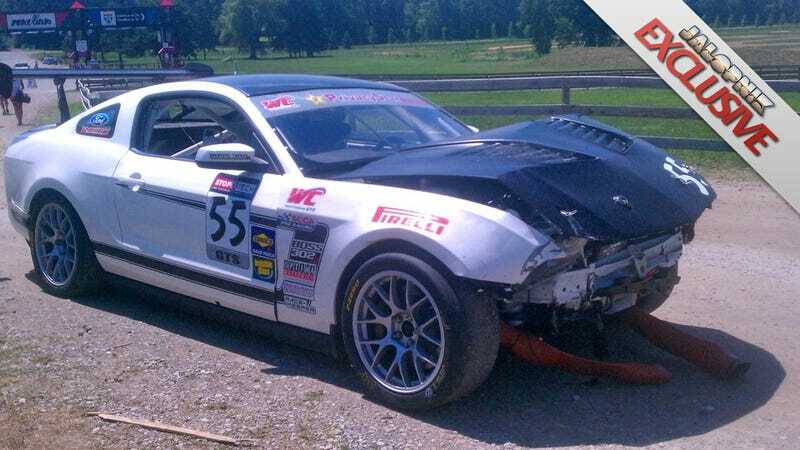 Caught by tipster Lucas, this Boss 302S was competing in the second race of the Pirelli World Challenge GTS class when it went a touch sideways, quickly tapped its left rear against another car and over compensated into the wall face first. The driver walked away without injury. The Boss 302S — stamped with the 001 VIN plate at the factory — did not. The car belongs to racer Richard Golinello, a veteran Ford Mustang driver who managed to place fourth in the final GTS race with the FR500S he raced last year. Golinello had been talking up the benefits of the 302S, and had gotten the keys just a few months ago. Its up to Golinello to decide what happens to the first Boss 302S from here, but there's no shame in saying its days were short just because racecar. UPDATE: Golinello writes us to note that the crash was caused when his Boss was tapped by another Mustang exiting the keyhole turn at Mid-Ohio, as shown in this video of the race (about 26 minutes in.) And as for the car, he plans to have it on the track for the race at Infinieon Aug. 26.